Swimming is often a sport for all ages. It helps young people today to tone their muscles and grow healthy and strong. For the elderly, there's no greater method to exercise than discovering a Cambodia Swimming Pool to escape from everyday routine. Swimia.com has the most up-to-date database on the internet about nearly any Cambodia Swimming Pool. Classified by countries, regions and cities, it can be painless to find the nearest pool at the places you visit. For Cambodia, you can have a look at the pools we have gathered for you. We most likely don't know all of the Pools in Cambodia. Are you missing any? Contact us!. There are often discounts available to senior citizens and little children for independent swim. 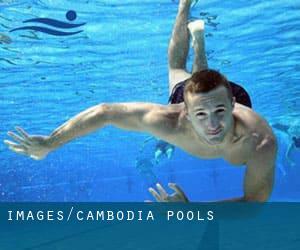 Discover by contacting your nearest pool among these Cambodia Pools. Please use the contact information provided at every pool profile to check if they're offering aquagym lessons, for the reason that is just not so prevalent to see an Aquagym in Cambodia. The best Cambodia Pools are situated mainly in massive cities, but it is also effortless to locate public pools in rural places. One with the advantages of outdoor swimming in Cambodia may be the possibility to sunbathe during the summer season. Taking it with extra care, sunbathing is healthful considering that introduces Vitamin D into the body, so the very best alternative seems to be switching among indoor and outdoor pools based on the season. Holding an estimated population of 75.244, Kâmpóng Chhnăng is among the most important cities in Cambodia. Check all the Swimming Pool in Kâmpóng Chhnăng and its surrounding area. Let us tell you a secret to switch off while you're in Battambang: just select a Swimming Pool in Battambang and plunge into the water! There's no additional successful process. Whereas Sihanoukville is one of the six most populous cities in Cambodia with almost 156.691 residents, you shouldn't miss that one if you're going to Cambodia. Without a shadow of a doubt, swimming in Phnom Penh may be the most effective way to unwind immediately after work. Take a couple of minutes to browse Swimia's catalog to find a Pool in Phnom Penh. It's hard to visit Cambodia without dropping by Siem Reap (with 139.458 residents). Currently Swimia is showing you all the Swimming Pool in Siem Reap and also the closest pools located in its vicinity. Swimming is actually a excellent idea to help keep your body active during your visit to Paôy Pêt (Cambodia), or even for anyone who is a local. Swimia helps you to locate your closest Pool in Paôy Pêt. By Wat Bo Street , Wat Po Lanka District , Siem Reap . This sports center delivers 18 meters x 5.5 meters, Outdoors. Contact information for this Swimming Pool for instance phone number and email address are number. 1 Vithei Charles de Gaulle, Khum Svay Dang Kum , Siem Reap . Swimmers like you reported 35 meters, Outdoors. Phone number and e-mail address are number for this Swimming Pool. Daun Penh Road of Wat Phnom , Phnom Penh . This sports center gives Olympic size, 6 lanes, Outdoors. For this Swimming Pool, only phone number is number here. 7 Makara Street , Siem Reap . This sports center provides 22 meters, Outdoors. Contact information for this Pool such as phone number and e-mail address are number. National Road No.6 ( Airport Road ) , Phum Kruos Kum Svay Dang Kom , Siem Reap . This sports center offers 25 meters, Outdoors. Contact details for this Swimming Pool such as phone number and e-mail address are number. 296 Blvd Mao Tsé Toung , Phnom Penh . Swimmers like you reported 25 meters (+/-), Outdoors. Phone number and e-mail address are number for this Pool. 92 Rukhak Vithei Daun Penh (off Monivong Boulevard) , Sangkat Wat Phnom , Phnom Penh . This sports center gives 19 meters, Outdoors. Contact information for this Swimming Pool similar to phone number and email address are number. Road to Angkor , Siem Reap . Among all the activities offered by the center, if you are considering swimming you might enjoy 17.5 meters, Outdoors. If you have to contact this Pool, email address and phone number are both number. Vithei Charles de Gaulle , Khum Svay Dang Kum , Siem Reap . This sports center provides ~35 meters x ~20 meters, Outdoors. Contact information for this Swimming Pool for example phone number and e-mail address are number. 313 Sisowath Quay , Phnom Penh . Swimmers like you reported 25 meters x 12 meters, 1.4 meters depth, 1.4 meters depth, Outdoors. Unfortunately we do not have the email address of this Pool, but we can provide you with the phone number.